Nothing gives us more pleasure than raising money for various charities and organizations. Women’s health issues are the closest to our heart since many of our beloved guests and staff members have been effected by breast cancer and other diseases. Our generous team of professionals loves to donate their time to fashion shows and “make overs” for local charities including the Ellie Fund’s Oscar Night Boston event. Buddy and David are both members of the South Shore Hospital Presidents Circle and do whatever they can to help the hospital. We are particularly involved in raising money for South Shore Hospital’s Journey of Hope Campaign which benefits their brand new cancer center. 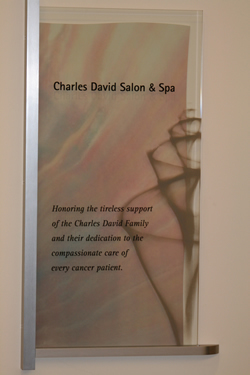 The staff of Charles David Salon & Spa were honored with a plaque that will hang at the South Shore Hospital Cancer Center to thank them for all them for their generous support throughout the years. 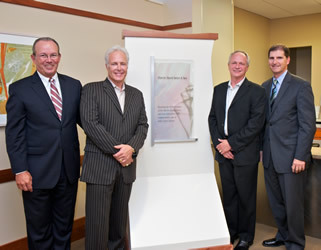 The plaque reads, "Honoring the tireless support of the Charles David Family and their dedication to the compassionate care of every cancer patient". Charles David and their staff donate their time and all the money from the appointments booked on this one day event. One hundred percent of the proceeds from all salon services including hair, nails, make-up, waxing, body treatments and products are donated to benefit cancer care programs at South Shore Hospital and the Moonlight & Miracles Gala. 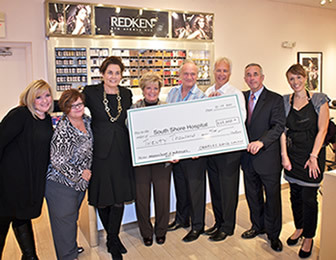 Following our annual Benefit Day in 2011, the staff at Charles David Salon presented the monies raised from the event to South Shore Hospital. Special thanks to all of our guests who came in for services that day. Photograph Courtesy of Richard W. Green. Watch buddy & david from the ellie fund red carpet! 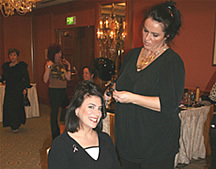 Charles David Salon was at Oscar Night® Boston to make everyone red carpet ready. We were chosen to handle all of the hair and makeup needs for the celebrities emceeing the event including WCVB’s JC Monahan, Bianca de la Garza and Kelley Tuthill. Other guests of the event were seen entering the room as ordinary looking women and leaving ready for their close ups. We were happy to donate our time, styling products and all proceeds from the event, equaling in excess of $8,000 to The Ellie Fund. The Ellie Fund is a non-profit organization that provides services such as transportation to medical appointments, house cleaning and healthy meals to Massachusetts women fighting breast cancer. For the past 15 years The Ellie Fund has been the only Oscar party officially sanctioned by the Academy of Arts and Sciences in Massachusetts. David and Buddy with South Shore Hospital's President/CEO Richard Aubut. Click here for more information about the Journey of Hope. Honorary Co-Chairs: Red Sox Player Tim Wakefield and his wife Stacy join Joan Stanley and her husband Bob--formerly of the Boston Red Sox. Campaign co-chairs Helen Garvey & Denise Teixeira flank WBZ-TV News Anchor and Event Mistress of Ceremonies Lisa Hughes. The staff at Charles David Salon and Spa works one Sunday a year specifically to give back to South Shore Hospital. All monies raised benefits the new Cancer Center. Combined with raffles and donations Charles David Salon was able to raise $17,000! 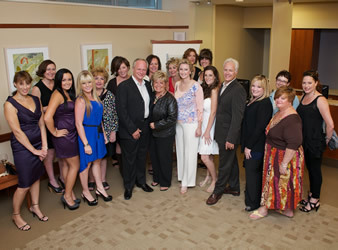 Here is a picture of Buddy and some of the stylists who gave up their Sunday for this great cause. One of our favorite annual events is the Kelley for Ellie Fundraiser. The fashion show is in honor of NewsCenter 5 reporter Kelley Tuthill who was diagnosed with breast cancer in 2007 and conceived by her WCVB Channel 5 News coworker and Tuthill’s close friend, Susan Wornick. All proceeds benefit the Ellie Fund a Needham-based breast cancer charity which supports the families of women undergoing treatment for breast cancer. Over 350 people attended the star studded event (including Wes Welker from the Patriots) and $71,000 was raised. Charles David Salon was happy to donate styling services to bring out the natural beauty of all the models. For more information about the Ellie Fund, go to www.elliefund.org. 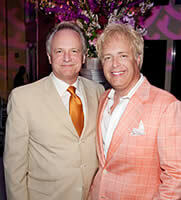 Visit Michael Blanchard Photography to view all the fabulous pictures from the event. Charles David Salon joined the Norwell Women's Club again this year for their annual Spring Fashion Show fundraiser, "Back in Black". The event was a smashing success, raising over $14,000 for South Shore charities. The models looked stunning, as the Charles David team, with Jane Iredale artists, provided all the hairstyling and make-up. 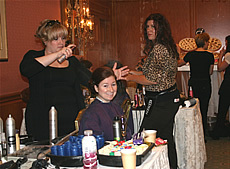 Guests left with “schwag" bags, filled with samples from Murad, Redken, Pureology and Jane Iredale. Below you will see some photos take by Renee Pithie and be sure to check out video from the event on the monitors in the salon coming soon!